In my experience, some users preferred to have *3 (the year in the front and all numeric), so that it could be sorted automatically. 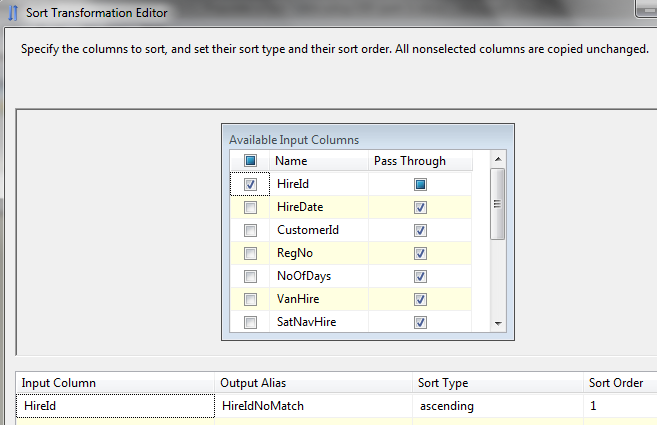 In SSAS, you can have the sort key so that *1 and *2 can be sorted automatically too. But after the data has been exported to Excel, it’s not sorted any more. This is also the case with Quarter attribute. It’s no good to have Q1, Q2, Q3 without the year. We need to have the year there to be able to drill down, i.e. 2012 Q1, 2012 Q2, 2012 Q3. This way, the quarter attribute can be made into a hierarchy, i.e. 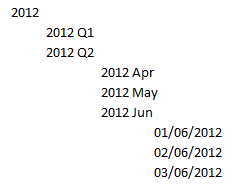 The same with date attribute, it needs to have the year and month elements, i.e. My point here is: to make a date hierarchy (in AS/BO/Cognos), the month attribute must have more members than the quarter attribute. And the quarter attribute must have more members than the year attribute, so that we can drill down from year to quarter to month to date. It is easier for the reader to understand if we give an example. It is often easier for them to understand the example, than the definition. I believe that human learn best using examples, not by understanding the definitions. 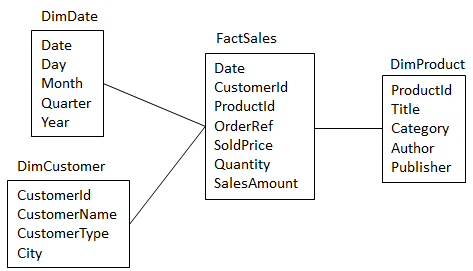 For example, rather than explaining how to populate a fact table, it is better to actually do it in SSIS and take the readers through the process, step by step. An example provides the reader/learner with something to copy. It is quicker to make readers understand a procedure if we snow them how the end result looks like, before we begin. 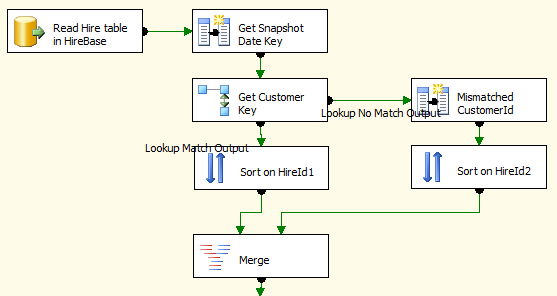 For example, before explaining the 6 steps of how to build an SSIS workflow that populate a dimension, readers will have clearer understanding if we first display the screenshot: “This is how it will look when we finish. Now let’s do it step by step.” Because now the readers have the big picture in their mind of what they are trying to achieve. Rather trying to be perfect and explain 16 steps required to build a cube, it is better to start with just 6 steps, the most basic one. Then after we have succeeded to make the user/reader understand the basic 6 steps, we introduce 3 additional steps. And after they can truly grasp the 9 steps, we add 3 more, and so on until we reach the perfect 16 steps. But if you try to explain all 16 in the beginning, it will take longer time for them to understand. 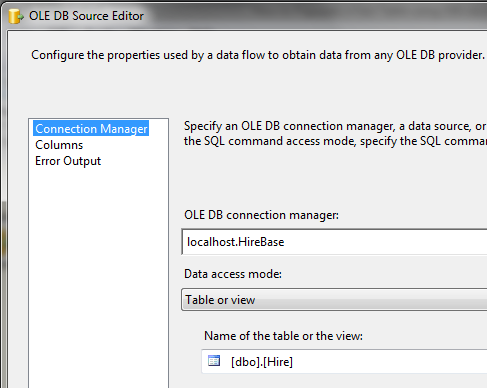 Rather than typing 1000 words try to explain Resource Governor in SQL Server, it is quicker to just show them the screens. Ideally it’s video capture, but if you can’t then static picture will do. Pictures are much better than words in explaining things to other people. 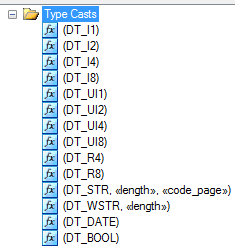 In part 1 (link) we have populated a fact table (FactHire) by reading the source table (Hire) and looking up 3 dimensions (DimCustomer, DimVan and DimDate) to get the surrogate dimension keys and then insert into FactHire. The Lookup transform we try to convert the natural keys from the Hire table (Customer ID, Registration No and Hire Date) to the dimension keys (CustomerKey, VanKey and HireDateKey) by looking up the dimension table. Consider that in the Hire table we have a CustomerId of 123. We search DimCustomer and we couldn’t find CustomerId 123. In this case we need to set the Customer Key to 0. So why do we sort on HireId? Why not on other column? Because HireId is a unique identifier. It uniquely identifies a hire transaction. Imagine this scenario: there are 1000 rows on the Hire table in HireBase. 997 of them has CustomerId exist in DimCustomer, and 3 of them has CustomerId which don’t exist in DimCustomer. So the Match Output will have 997 rows and No Match Output will have 3 rows. 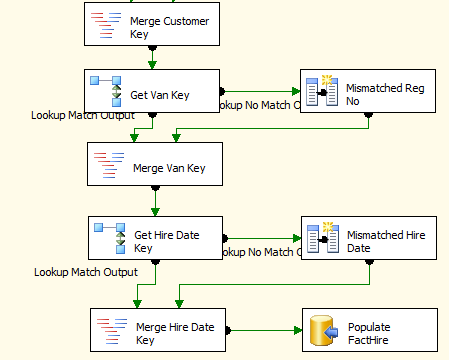 When we merge them again, we want to use a column which was a unique ID before they split up, so that when they merge this unique ID will identify them properly. Now our lookup is complete and proper. We have processed the No Match rows. 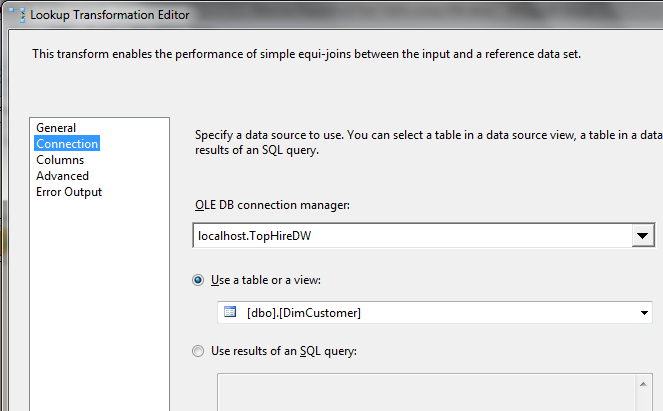 One of the basic principles of data warehouse ETL is “RERUNABILITY”. Meaning that we need to be able to run the ETL several times a day without causing any issue to the data. In terms of loading a Period Snapshot Fact table, this means that we need to delete the [today’s date rows] in the target fact table, before we load the new rows. 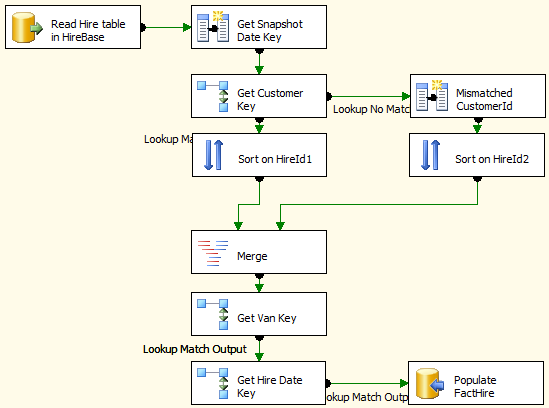 Let’s say that this morning the ETL ran, pumping 1000 rows into the FactHire table, all with Snapshot Date = today. And now (say 2pm) if we were to run it again, it will pump another 1000 rows with Snapshot Date = today, causing duplication of data. Because of this we need to delete today’s rows in the target fact table. Unfortunately we can’t use truncate in this case because we only want to delete today’s rows, not yesterday’s ones or any other dates before today. We need an index to be created JUST on Snapshot Date. I repeat: JUST on the Snapshot Date. We don’t want covering index or query help index or any multi key index, we just want Snapshot Date alone. Why? Because if we put other column on the index it may not get used when we delete today’s rows because the selectivity is too low. Can we use table partitioning? Yes we can. We can (sometimes we should, if the volume warrants it) partition a periodic snapshot fact table on Snapshot Date. 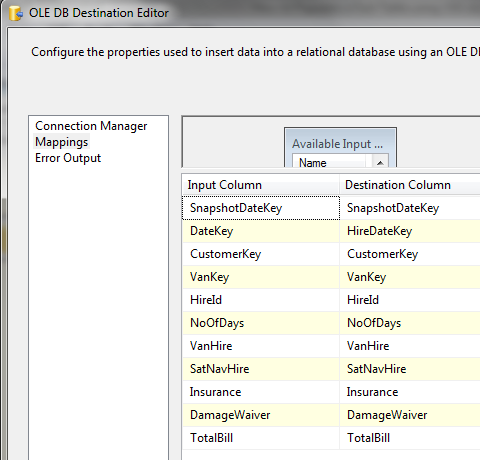 But sometimes we can’t because the partitioning key is used for something more selecting, such as on product Id. But in majority of the cases we can. Any way I digress. We need to delete today’s rows. Should you want to discuss further about partitioning you can email me at vrainardi@gmail.com. And the script task populates a global variable so that all workflows in the package can use it. Of course in the real project there would be a lot of dimension population work flow, before it hits the fact table population. So that’s it, we have done 2 things that we set out at the beginning of this article: to process the No Match Output and to delete today’s rows if any. 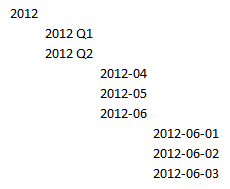 This usually happen if you need to insert Date Key into a fact table. 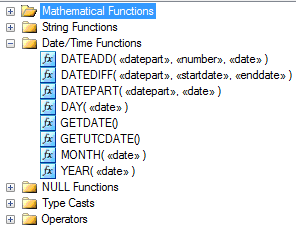 You need do convert a date from the source table which has datetime data type to integer, i.e. from ‘2012-05-26 00:00:00’ to 20120526. 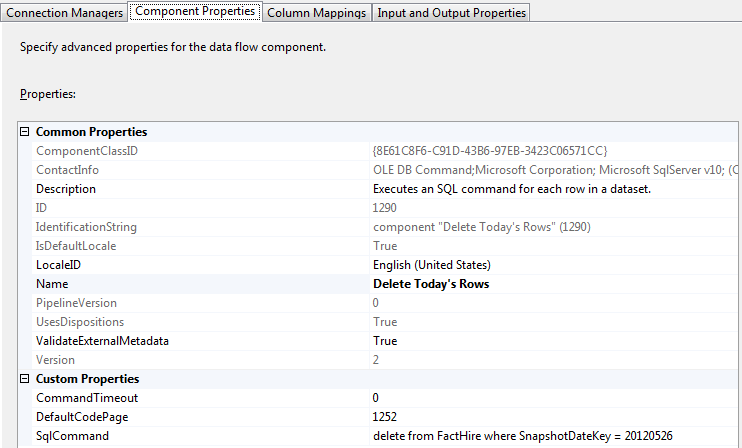 But in SSIS data flow, what do you do? 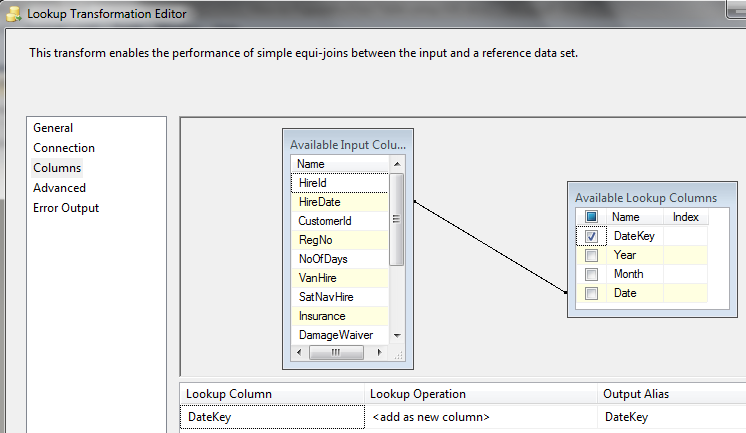 The Derived Column transformation will add a new column to the workflow, which is the integer Date Key. So to convert today’s date to integer, the idea is to get the year component, and the month component and the day component (as 3 different string), then concatenate them, then convert to integer. So we will get a string like this: “20120522”. The data types should not be changed with informing the downstream systems. Imagine if you were responsible to maintain the company data warehouse. And imagine that one source system suddenly changes the data types from varchar(30) to varchar(100), or from decimal(12,4) to decimal(20,4), without talking to you first. One day suddenly your warehouse batch failed and your team needs to fix it there and then. That would not be appropriate right? So, if you are lucky enough to be the owner of an upstream system, you should not update your data types without first informing all downstream systems (including the data warehouse and BI systems) and agree with them an implementation date. 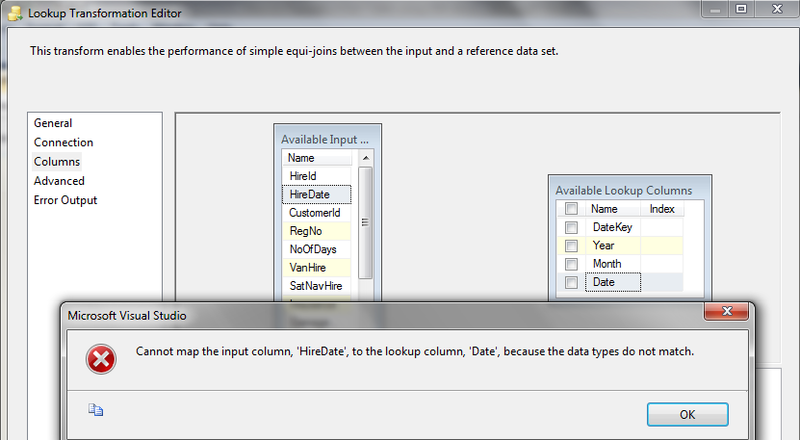 On that date both you and them change the data type at the same time. The source system can do what they like and we in the warehouse would suffer, right? Wrong. But in practical world, that’s what happen. The source system can drop a column any time they like. They can even drop a table. If we in DW read this column or table then we are stuffed! 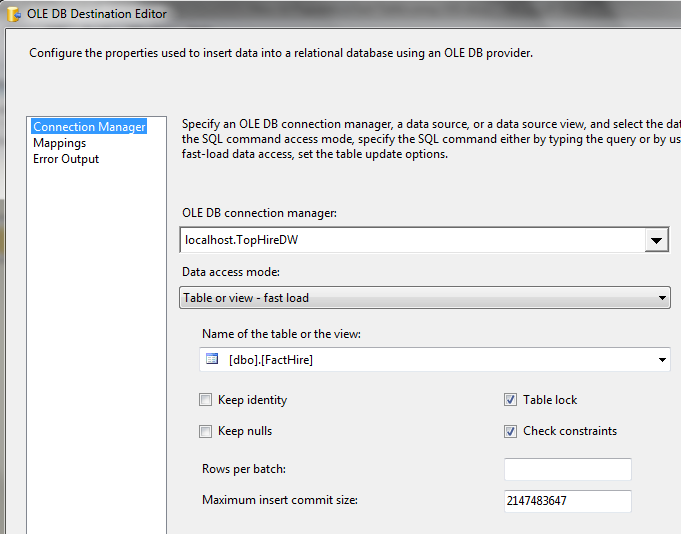 Our ETL suddenly stops working because the whole table is gone from the source system. What a wonderful way to start the week if on Monday morning we found that our DW batch failed because of a table was dropped from source. If this happens to you, insist to the source system that they have to back out that change. Then agree with them a date when they can do that, in the mean time you can prepare the DW to be ready to accept that change. The interface will be a file of this format (attached a File Spec), publish daily Mon-Fri at 11:15 pm on MQ (message queue), under this ID (attach the MQ spec). We (DW) will be reading directly from your database. 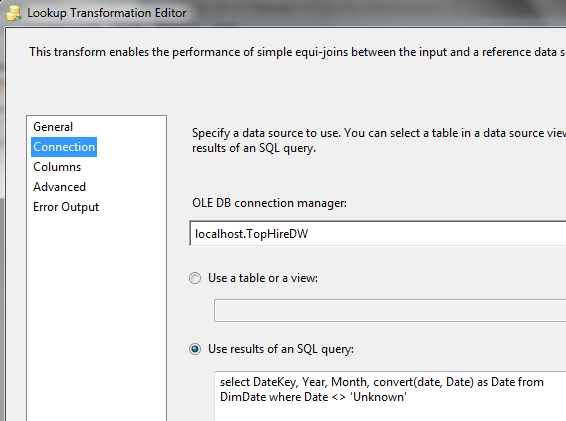 Any DB must be notified to us 4 weeks in advance, especially table/view/column renaming/deletion (exception: new column/table/view). That is called “Systems Interface Contract” (SIC). The interface should be signed by all parties involved. If you just read their table without agreeing anything then they can change their table any time and you are stuffed! Some companies built their data warehouses without surrogate keys. They have a customer table in their business system, with the primary key of CustomerId. In the data warehouse, they also use CustomerId as the primary key. One would thought “oh it’s probably an Inmon style warehouse”, but no, it was fact and dim, Kimball style warehouse. In the DimCustomer, they don’t have a surrogate key. Instead, they use CustomerId as the PK! Talking to them I tried to understand the reasons why they did it that way. “Because we just want to truncate the DimCustomer and reload it every day. That would make it simple. We don’t need to find out which rows have changed and which rows are new rows. We simply delete everything in the dim and reload the customer table from the OLTP!” Then I realised that was the reason they couldn’t have a surrogate key in their DimClient. Because if they did they could not truncate reload the dim because the surrogate key would have changed. If on day 1 they have 1000 rows with ClientKey of 1 to 1000. On day 2, after truncate reload, the ClientKey will become 1001 to 2000. And that makes their live even more difficult: they would have to change the ClientKey in the fact table. So for that reason, they use ClientId as well in the fact table, i.e. the PK in the OLTP. This way, in the dim the PK is 1 to 1000, and in the fact table, the PK is also 1 to 1000, and they match! 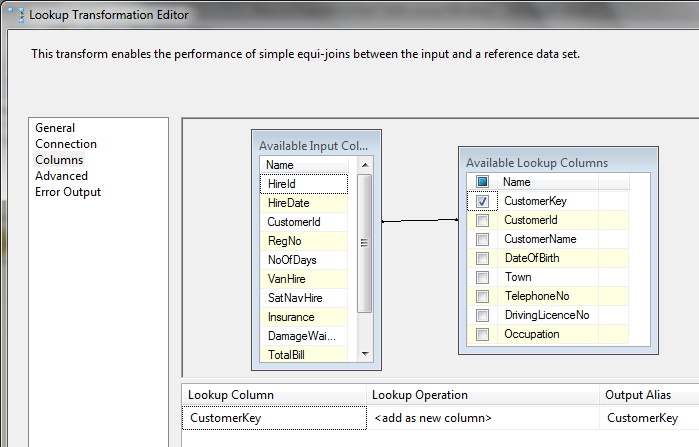 Well, if not having surrogate keys make life easier, why do we bother creating surrogate keys in the data warehouse? To integrate multiple source systems which may have the same natural keys, i.e. the same CustomerId or ProductId. True, that is true, we can join multiple source systems by using SourceId column in both the fact and the dim. So that we can have the Unknown Row. If we don’t know who the Customer is for a particular sales transaction, we point the fact row to this Unknown Row. Same with DimProduct and all other dimensions. If the CustomerId changes from numeric to alphanumeric in the OLTP, we don’t need to change all the fact tables. (We do if we use CustomerId as the primary key of the dimension). This is actually the core reason why we use surrogate key: because the natural key can change. We want to be able to update the natural key easily, without updating all the fact tables that use that dimension. Another advantage is a surrogate key is performance: it is 1 integer column. 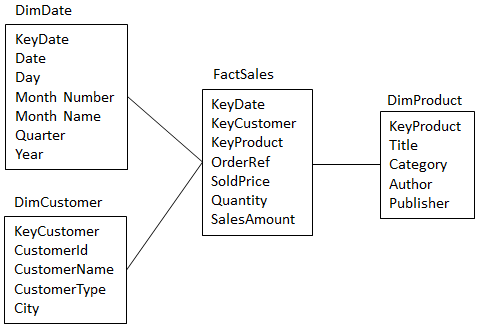 The natural key may consist of several columns, for example: the PK of a bank account table is: branch code + product type code + account number. It is possible that 2 banks merged and their accounts were merged too, causing duplicate hence they prefix it again with the bank code, so it becomes: bank code + branch code + product type code + account number. That is long. Only one integer column is much shorter and more performant. It is quicker to index and quicker to find. So those are the reasons why we have surrogate keys in the data warehouse! I hope this article helps those who are convinced that they need to use star schema and surrogate keys, but never knew the reasons. 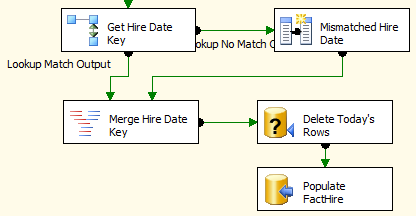 I hope they now understand the reasons behind using surrogate keys in a star schema. Personally this case helped me understand the reasons why some people chose not to use surrogate key. Throughout the years I’ve heard many “pro arguments” about using SK, but very few “contra arguments” in using surrogate keys. In this particular case, they didn’t even know how to maintain a surrogate key. 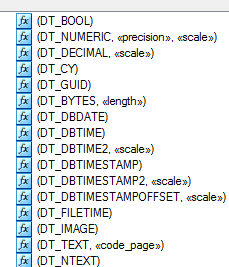 They liked the idea of “maintaining the history of the attributes” after I explained it, but they didn’t know the technicalities to do it in SSIS. It seems very complex and would take a lot of their time. 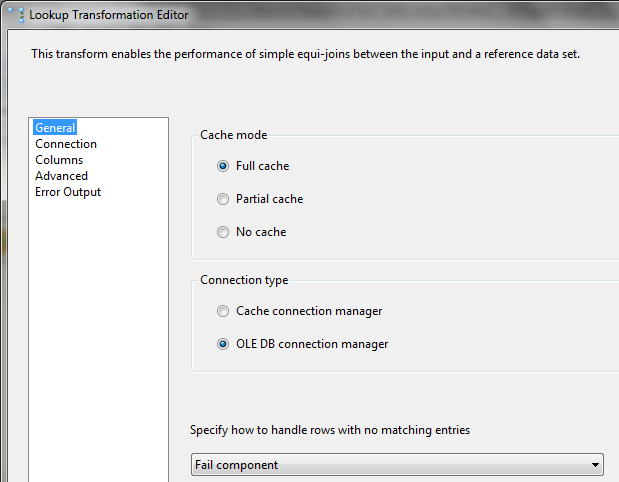 When I introduced SCD transform in SSIS workflow to them, their eyes were bright and cheerful. “Wow that would make things a lot easier,” they said. Over the years, some companies have tried to make this Surrogate Key build business easier. Kalido and Wherescape for example, enable us to build a DW without worrying about the complicated issue of Surrogate Keys. Once again the main reason of using surrogate key is to detach the data warehouse from the source system. To make the data warehouse more independent from the source system, and therefore gives us a more flexible design as a result. And the main benefit is that SKs enable us to maintain the history of the attributes in the dimension using SCD type 2.